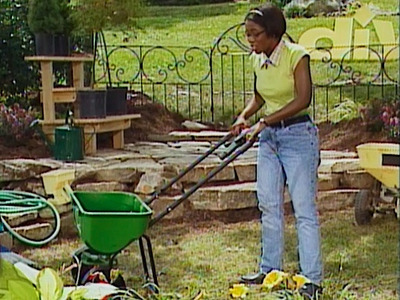 Apply fertilizer with a spreader, available at home stores. A walk-behind or motorized spreader is more accurate than a hand-held version. As you move the machine back and forth over the grass, grip the handle like a trigger and it releases pellets when you "shoot." Follow the instructions on the fertilizer package. Apply only the recommended amount. This is not a case of "If a little is good, even more is better: -too much fertilizer can burn your grass. Provide some extra air for grass roots by aerating your lawn -taking out spikes of soil across your lawn to make holes for planting seed. Aerating is low-cost maintenance and even if it's the only thing you do for your yard, you should see improvement. There are motorized aerators for rent, or manual versions that work like pogo sticks, pushing out two plugs of soil at a time. The pogo-stick versions are good exercise, but beware: the motorized versions can require substantial upper body strength to use. Purchase grass seed that says "cool season" or "cool weather" on the package, such as most fescues. Scatter it over the lawn with the same spreader you used for the fertilizer, or use a hand-held spreader for less fuss. Try to get the seed evenly distributed so you won't have clumps of grass later. Drag the rake over the lawn to break up soil clumps and cover the seecds a bit. Water the lawn with the garden hose, using a nice gentle spray like rain. After that, keep the soil moist but don't overater it or let it dry out. You may have to mow your lawn a few more times before the cold weather sets in, and you can also fertilize another time in a few weeks to help the grass grow. During the cooler months, you should see a lot of growth as a result of your labors. Scott Boehnlein is the owner of one of the fastest growing and aggressive real estate teams in the Greater Louisville Area. With sale volume over $123 million, his team has rose to the Top 10 ranked real estate team in the Louisville area. Our marketing plan is proven. We will get your home sold fast and for the most money! Check us out as www.ViewLouisvilleHomes.com. Drain your exterior spigot. 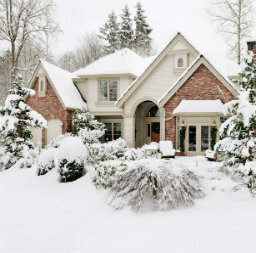 If you don't have a burst-proof spigot (the spout on the exterior of your home that connects to a water hose), the extreme cold of winter can cause the pipes connected to the spigot to burst. To keep that from happening, make sure there's no water left in the spigot pipe by the time cold weather hits. Be sure your pipes are well insulated. Although your pipes shouldn't run throught exterior wallls, they sometimes do, Goldstein says--especially in older homes. If that's the case, proper insulation will helop to keep them from freezing. However, if the pipes aren't well insulated and insulating them before it gets cold isn't a possibility, there are a few tricks to keep them from freezing: 1. If your kitchen sink is on an exterior wall, when it gets frigid, open the cabinets underneath because that lets warm air from the inside of the home help heat the pipes. 2. Turning your sink on slightly and letting the water trickle into the sink will also help because it keeps the water moving. Put weather stripping around exterior doors. If there are big gaps around your doors and windows, use caulk to keep cold air out. Expanding foam is also good for sealing. Put shrinkable plastic over particularly leaky windows. Make sure exterior drains and gutters are clear of debris. If it snows and your gutters aren't clear, the melt is likely to back up. If your gutters are backed up with leaves, that will weigh them down and possibly cause them to break. Get your furnace tuned up. If a heating and cooling specialist hasn't taken a look at your furnace in the last year or two, it needs to be checked. You should also remember to change the air filter regularly, as that will allow your furnace to work more efficiently and keep it running better. Filters in the system collect all the dust and debris in the air, and the dirtier they get, the harder it makes you system work. Cover outdoor furniture. If you have a grill, keep a good cover on it as well as on any other outdoor furniture. Snow or cold can damage wood over time, metal will eventually rust and plastic can harden and crack. Have your chimney checked. If you have a wood-burning fireplace, soot can collect over time and clog the chimney. Have a professional look at your chimney every year or every other year to prevent a fire hazard during the winter months. These seven winter home maintenance tips were offered by Michael Goldstein, a Chicago handyman who is also known as the "Mensch with a Wrench."